Shakespeare is getting a makeover for the Singularity. Comic book legend Stan Lee used his appearance at the New York Comic Con to announce a new graphic novel based on the bard’s most famous love story. 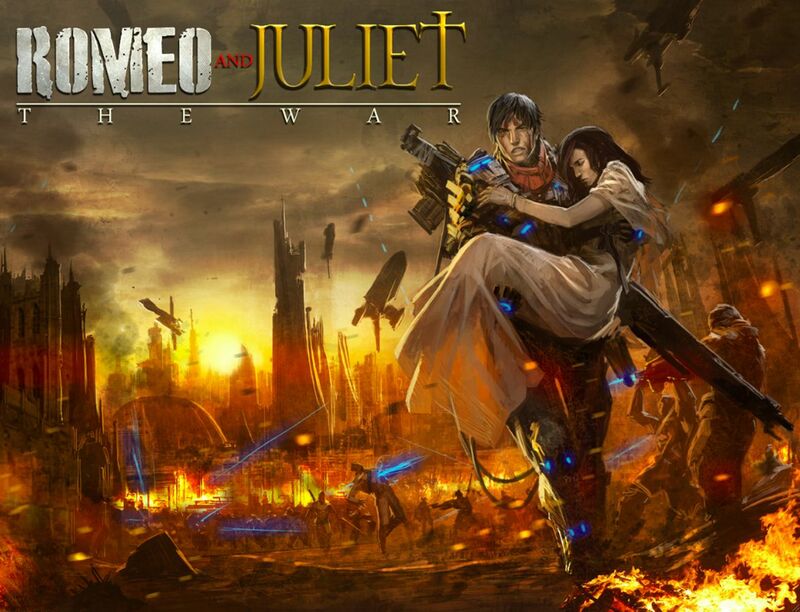 The new rendition, titled Romeo and Juliet: The War, is set in a future full of advanced technologies. The feuding families of Montagues and Capulets are now super soldiers complete with genetic enhancements and cutting edge cybernetics. Romeo even sports a robotic arm. Is it silly? Oh, hell yes. But it’s the kind of science fiction insanity that I love to see. With Stan Lee penning the story you know it will have all the grit, humor, and action that made his past creations so epic. Check out sneak peaks of Romeo and Juliet: The War in the photos below. The artwork by Skan Srisuwan is beautiful. Whether you prefer superheroes or Shakespeare, there’s enough geekiness here to fuel a nerdgasm. Romeo and Juliet: The War is one of three graphic novels that Stan Lee will be producing with up and coming imprint 1821 Comics. No news yet on what the other two books will cover. Can we expect Stan Lee’s scifi version of Hamlet or MacBeth? One can only shudder and hope. Two groups of superhuman soldiers who turned the Empire of Verona into the most powerful territory on earth. The MONTAGUES, powerful cyborgs made of artificial DNA, and the CAPULETS, genetically enhanced humans known for their speed and agility, worked in tandem to destroy all threats to the city. With no one left to fight, the Montagues and Capulets found themselves a new enemy: each other. My, but the cheesiness practically leaps off the page, doesn’t it? Well, I can suppress my groans about the horrifically inaccurate depictions of cybernetics, genetic modifications, and biotechnology that Lee is likely to create. It’s not about the believability, after all, it’s about fun. That’s something that Lee knows very well. From The Incredible Hulk to Spiderman to the Xmen, the most famous man in comics has proven time and again that he can create characters that are fun to watch and engrossing to read about. Who knows, maybe his scifi version of R&J will help bring a little interest to the technologies he uses to tell his story. Could people be drawn to believe in the Singularity through a comic book? Stan Lee has inspired crazier behavior, I assure you.